I love music. In fact, while in high school, I used to play bass in a band and now, whether walking, driving or painting, you will most commonly find me with my headphones on listening to one playlist or another, giving the soundtrack to my life. Further, I like all manner of music but because of my Texas roots, I was exposed to country and western singing early in my life and have remained a fan ever since. Songs of lost love, whiskey nights, old trucks and good dogs are often bouncing around my thoughts as I hum familiar tunes. Because it is a part of me, I have started a new series of paintings, Musical Moods, honoring the music and the artists that create it. In the first of this series, Hank’s Honky Tonk, I pay homage to many of my favorite country and western musicians and songs. A man in black tends bar while the band, “The Lonesome Criers” plays. 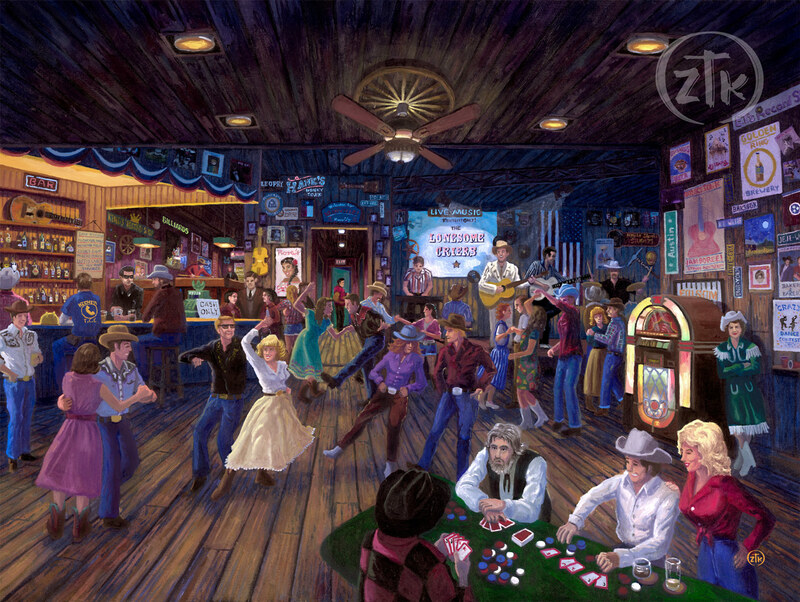 The Honk Tonk’s namesake plays guitar and sings in lament while a smartly dressed woman leans against the jukebox perhaps considering her potential to feel “crazy” at the dance advertised above her. A gambler deals cards and a woman in a flowing dress is twirled about the dance floor, not being satisfied to simply stand by her man. In the crowd, you might find four who should be able to win the million dollar quartet competition but you should hurry as one of the potential favorites seems to almost have left the building. In total, there are over 50 references to the history of country and western music, the most significant songs, albums, and important artists. I invite to you look for them all and to truly enjoy your visit to Hank’s Honky Tonk. And, as always, I want to thank you for sharing my adventures in art. This is the first in a new series, Musical Moods paying homage to different music genres. Future images will feature classic, rock, and blues. There are 11 references to famous people. Can you find them all? There are 10 references to well-known country songs. Look at the posters and signs carefully for some clues. There are references to 19 country albums. There’s a singer who chose to dance as opposed to standing by her man. Country royalty is about to leave the building. Can you figure out why the bartender doesn’t take credit? Do you know why the band on the stage seems so lonesome they could cry? Is the poker player going to hold them or fold them? Eight license plates give hints to classic and new country stars. A pink Cadillac is an ode to the king. Copyright: © Zachary Thomas Kinkade © 2018 Art Brand Studios, LLC. All rights reserved.